I stumbled upon this image. Christopher Webb designed this London Subway map of all the different ways to work. It has to do with Agile thinking and different frameworks and methods to work in this way of thinking. Apart from the fact that it is a complex network it made me think. You can look at it the same way as you look at a real subway map. The whole is complex. So many directions and options to travel. But that is the whole point. You don’t need to go everywhere. You just need to pick one destination and take the correct route to get there. When you travel in the real world you just need to follow one, maybe two colors to get to your destination. The same goes for change within your company. Don’t do everything. Pick one route and stick to it. Forget all the other tunnels and tracks and just travel to where you want to go. Or at least what feels right to go to. I often see companies that adapt to almost everything. Who mix up various routes and try to get somewhere and often that does not work. Like in real live traveling you cannot just pick the nice stations and skip the boring, smelly and ugly once. You need to pass each one. And that is why I like this map. Not for all the information it provides and the connections it shows. But for the metaphor it provides. So I can keep this blog very short and hope that you get what I’m try to explain. If you want to get to a certain destination, pick your framework, method or way of working. Do every step, even the once you don’t like or that don’t seem to add value. Learn from each step and know why you like or dislike it and see what is there. Until you get to where you want to be. And if you see a different route that get’s you to the same destination and it feels that it is better suited for you, then take it. But only switch stations at the right moment. 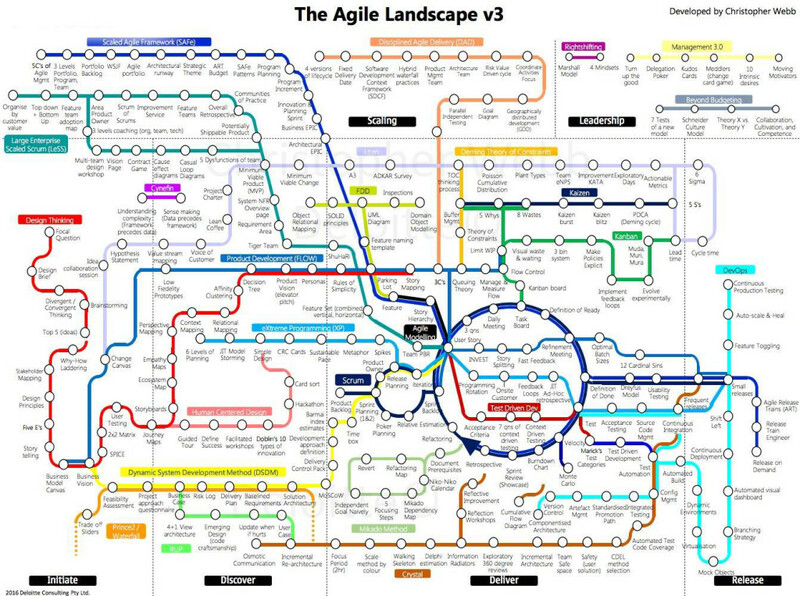 This entry was posted in Blog and tagged Agile, new thinking. Bookmark the permalink.